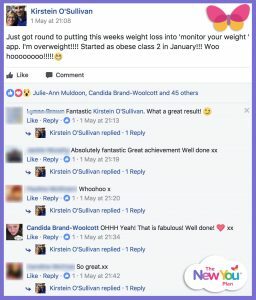 This week, Customer Transformation Coach Candida shares what’s been happening in our Secret Slimmers & Momentum Maintainers groups to bring you our community highlights of the week. Hello May! The sun has been smiling and the birds have been tweeting – Spring has finally arrived! This week in our amazing community you lovely Secret Slimmers have been incredible as always. There has been a real sense of commitment and engagement on the page, which is an integral part of your journey. This week saw the introduction of the new daily theme post. Each day I will post up a theme. These themes are there to motivate and guide you, to help you to engage and be part of our community. Watch the videos, update how your day is going under the thread and make that solid commitment to yourself to be the best you can possibly be. 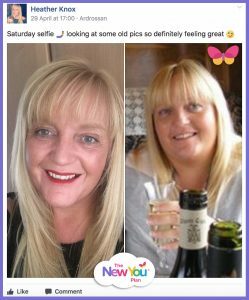 Firstly, how cool does New You Plan founder Julie-Ann look. Her words of encouragement are what keep us all going each day! Today is #selfiesaturday so make sure you take a selfie showing what your day has in store, and share it in Secret Slimmers. I absolutely love to read all your weight loss posts but for me, seeing you challenge and push yourselves out of your comfort zone or achieving goals you never thought you could possibly do is so exciting! Fiona Allison is a prime example of this. 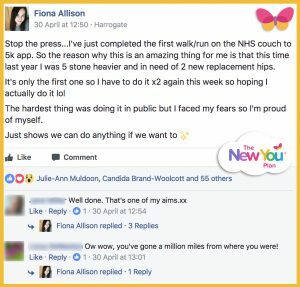 She has lost over five stone so far on her journey which has meant that she may not have to have a hip operation BUT not only this, she has been training for the Couch to 5K! Totally amazing! Allison is determined to turn her life around to get healthy and slim! Vicki is totally awe inspiring, pivoting negativity in to positivity. The plan and her utter dedication has created a powerful mindset. “Just got around to putting this week’s weight loss into ‘monitor your weight ‘ app. I’m overweight!!!! Started as obese class 2 in January!!! Woo hoooooooo!!!! !” – That definitely deserves a fist pump! 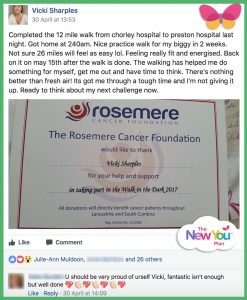 Lyndsey Power has also just finished her first week and feels like she has a new zest for life! Amazing! 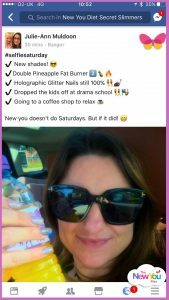 Michelle Hewitson-Maher absolutely blew us all away with her phenomenal one stone loss in her first week. You guys are super awesome and I cannot wait to watch your journey unfold. Heather Knox has been looking back over some old photos and as you can see she is looking WOW! Did you see Anne McClure’s mouth-watering Chocolate Brownie and Pancake waffles with an Orange Water Flavouring sauce? They looked to die for! So many of you have been creating gorgeous recipes with the packs and it’s so lovely to see. Keep inventing, keep taking photos and keep posting your dishes. 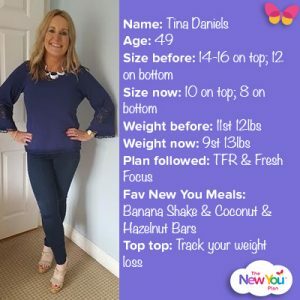 This week, I would like to introduce you to one gorgeous successful slimmer and Cheerleader – Tina Daniels. “Hiya! I’m Tina and I’ve lost two stone with the New You Plan. I’m in my late forties and always struggled to lose weight before New You. With working full time and a family I needed something that would give me real results and quick!! 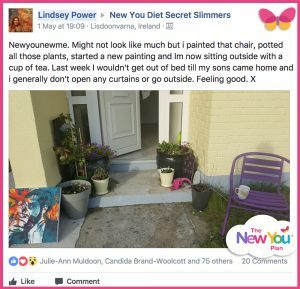 I think the reason this was successful for me was the Secret Slimmers page – the support and encouragement I got on SS was amazing and the inspirational stories of people like Dawn and Candida kept me focused. 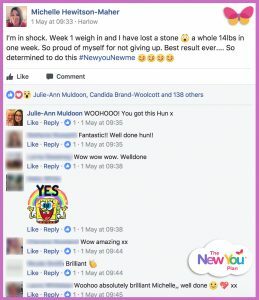 This is why I now love being a cheerleader – I love encouraging other slimmers and it’s a really positive environment – there are no failures – successes are celebrated and if we slip up we are encouraged and mentored to get back on plan.